•	A person(s) with an emotional attachment to the mission generated from personal experience, e.g., a parent whose child has early onset diabetes and has DA attributes described above. •	A person(s) who can be involved with board conflict and not be personally overwhelmed by it. •	A person(s) who does not owe allegiance to friends, family or colleagues also serving on he board. •	A person(s) who has acted as a change agent with other for-profit or nonprofit boards. •	A person(s) with sufficient time to positively drive change. Most of the characteristics described above are hard to assess because they are qualitative in character and require the nominations committee to have some unusual sophistication in the interviewing process. For example, the person needs to be visionary to see beyond the current “box” in which the organization finds itself, a difficult trait to perceive in an interview or from records. •	Help develop an enhanced vision that allows the organization to avoid the impact of disruptions by technology for social changes. •	Help reduce the conflict that will inevitably take place between legacy minded board members and those who want organization modification or reform. •	Help set the tone for change. •	Celebrate the “health and welfare” of what has been accomplished in the past. •	Demonstrate the importance of independent thinking and how it may impact the future of the organization. 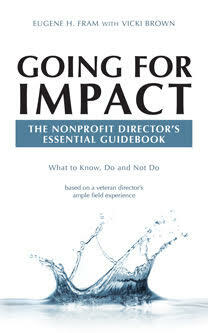 •	Help interest board candidates and potential senior managers in the nonprofit. ← Can Nonprofit Boards Learn from the Recent Carnegie Hall Disruption? I disagree that a Devil’s Advocate is helpful to a Nonprofit Board. Differing points of view, alternative problem resolutions offered in discussion can foster a well informed decision. A DA who is habitually argumentative will be more adept at impeding progress, and creating personal conflicts between board members. Even worse the DA can inspire Nonprofit staff to exceed their authority rather than solicit it’s Board for direction. Or disrespect one or more board members and perceive them as incompetent. I have dealt with too many DAs. They claim the intent is to get the board to think more before making a decision. Sometimes the strategy is successful. But the board would be better off with viable action alternative instead of obstinance. Norm: Thanks for extending the discussion. As noted in the article, a nonprofit should seek a a DA with a high EQ or Emotional Intelligence. This person knows how to be persistent without alienating all others. Very good and needed perspective to counter the softened group think culture that entrenches. I greatly appreciate your work here and this type of diversity is needed on every nonprofit board. It’s important for all to understand this is a smart role by a person who can have critical conversations that are helpful in long run. Thank you. Mike: Thanks for enhancing the discussion. Good governance means seeing more than one side of any issue. A good DA ensures a more inclusive debate. Thanks for the article. An excellent article, Dr. Fram, with sound advice to recruit trustees with the needed skills and attributes to compliment a Board’s overall diversity needs. These recruits must possess mature emotional intelligence and have a compassionate capability to apply this quality when challenging proposed actions (not individual Trustees), which appear to them to be biased, sustain negative or status quo outcomes, or have been inadequately researched or tested to yet be considered by the Board. These are rare individuals, but they can be found if one searches with care and a priority focus upon selecting candidates with mature, emotional intelligence characteristics. Thanks for you comment. Unfortunately not everybody agrees with us!!! Au contraire mon ami…there just happen to be a “DA” or two in the audience, as it should be…! Saying it in French adds to the luster! !